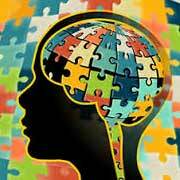 Autism is a spectrum disorder of the brain affecting the child lifelong. It is called a spectrum disorder because how each symptom will affect a child is unique. The symptoms of Autism spectrum disorder (ASD) usually become noticeable from 18 to 24 months, but they become more apparent during early childhood (24 months to 5 years). It affects how the child communicates with and relates to other people. A autistic child sees the world from a very different perspective and for them people’s body language and social behaviour can appear just as strange as if people speaking in Greek. That’s why children dealing with Autism find it very hard to deal with family interactions and social behaviour. And because of this disability they mostly resort to using of sign languages. Though each child deals with broadly the same condition, some can live relatively independent lives whereas others are totally dependent lifelong. Mostly the prime areas of difficulty faced are in social communication, interaction and imagination. They have difficulty in comprehending the meaning of words said by people; they find it difficult to understand people emotions and feeling and at the same time don’t know how to express theirs. They also find it hard to interpret other people’s thoughts, feelings and actions. Autistic people usually live in their own imaginative world and many people with autism are very creative and may be, for example, accomplished artists, musicians or writers. Autism is a behavioural disorder for which many conventional therapies are available like speech therapy etc. These therapies might help a child reduce incidences of repetitive behaviour or tackle speech abilities but do not address root cause of the problem and there is no breakthrough progress in dealing with this condition. But Thanks to the advent of stem cell research there is a new hope in Autism cure. Stem Cell Therapy for autism has the potential to repair weakened neurons in the brain and therefore improving communication and behavioural skills. It has been researched that earlier stem cell therapy for autism is done; the higher are the success rates for cure. One such company which has been successfully providing Stem Cell Treatment for Autism in India is Advancells. Advancells is passionately exploring the unlimited possibilities of Adult Stem cells in therapeutic application of regenerative medicine. Umang was born autistic and had not spoken any meaningful word till the age of 7. But after stem cell therapy he has recently started spoken his few meaningful words besides showing signs of significant improvement in symptoms, behaviour pattern and cognitive abilities, following his first round of adult stem cell therapy. In this context, Umang’s improvement is nothing short of a miracle and his parents have started dreaming of his future again.